It’s been almost a year since Greg and I traded our Silicon Valley apartment for two backpacks and a pair of one way tickets. We left everything we knew and began an adventure that we knew would change our lives, but had no idea how much. Over the last eight months I’ve learned more about Greg, and he about me, than we knew was ever possible. After spending a year and a half of our relationship doing long-distance, we thought that we’d talked through everything we could possibly talk through. Boy, were we wrong. The only thing harder than sustaining a long distance relationship is sustaining a 24/7 relationship. We travel together, live together, explore together, and now work together. As two strong, opinionated individuals, this has not been without its struggles. Our relationship has changed and evolved and continues to do so as we travel and adapt to new ideas and surroundings. For all the traveling couples out there, we’d like to share some tips to keep things going smooth(ish) on the road. All that glitters is not gold, and all parts of travel are not watching sunrises from mountaintops. Traveling has its hardships, and having a best friend who is there no matter what is often times more helpful and beneficial than having a romantic connection. Know when to be the best friend cheering each other on and making each other laugh, and when to bring the romantic spark out. At the end of the day, though traveling is great, the relationship has to take priority. If you’re determined that you’re traveling with your forever person, your relationship needs to come before everything else. Make time for date nights once in a while, and don’t forget about the little things throughout the day; they make the biggest differences. When spending every single day with any person, whether it be a significant other, family member, or friend, eventually you’re going to step on each others toes. Greg and I have both had our fair share of moments when we said some things we shouldn’t have, or picked an argument that was pointless. Always remember to apologize and forgive as quickly as possible while still being genuine so you can move on and enjoy the rest of your day. We’re only human after all! If I had a dime for how many arguments were started because one of us was hungry, tired, hot, or sore from carrying our backpacks, I’d buy a really big cup of cocoa. It’s never a good idea to argue or have an important conversation when one party is not on their ‘A-game’, so carry snacks and try to have big conversations after a nice meal. Whether traveling as a couple, solo, or in a group, there are going to be times that are difficult. Everybody misses home or the idea of home at some point, so establishing a sense of home in some small way can make the biggest difference. When Greg and I travel, I bring store bought coffee grounds and make a cup for both of us every day. This way, no matter where we are in the world, our mornings start the same. Greg’s sense of home comes from his over-ear headphones, which was his “can’t leave without” item during packing. Having a small item or daily routine helps keep a sense of home while traveling. When frustrations arise, it’s easy to say what’s on your mind without thinking about how it may come across to the other person. After spending so much time together, couples may become too comfortable and say things on accident that are hurtful. Recently, we started working on a new thought process that’s been going well so far. Before speaking, we ask ourselves, a) Is it kind? b) Is it necessary? c) Will it add value to our relationship/project/etc? If the answer to these questions is no, don’t say it. Traveling with someone who has drastically different goals than you will almost never work. Unless you find a way for your schedules and goals for travel to align, be prepared for a bumpy road. Figure out what works best for both of you in terms of when you go out, what you enjoy doing, and when you have work and relax days. Once this is established, everything will move more smoothly. At the end of the day, everyone needs some alone time. Greg and I learned that he enjoys experiencing nightlife, while I’m more of a PJ’s and Netflix kind of girl. We balance this by having Greg go out with travelers and explore the evening scene in different countries while I get some time to relax and just ‘be’. Everyone we’ve met handles alone time differently but agrees that it’s a crucial part to traveling as a couple. Don’t be afraid to take small breaks from each other! So many absurd, frustrating, surprising, crazy, and just “out-there” moments have happened during our travels, and we quickly learned that the only thing to do is laugh about it. As soon as we learned to make fun of ourselves (and each other) when things went wrong, traveling became even more fun. Take a breath, get some perspective, and just laugh! Whenever we meet other people traveling as a couple, Greg and I throw a mini geek fest. Making friends on the road is one of the coolest parts of travel, because you get to have a first hand look and fresh perspective into someone else’s way of living. 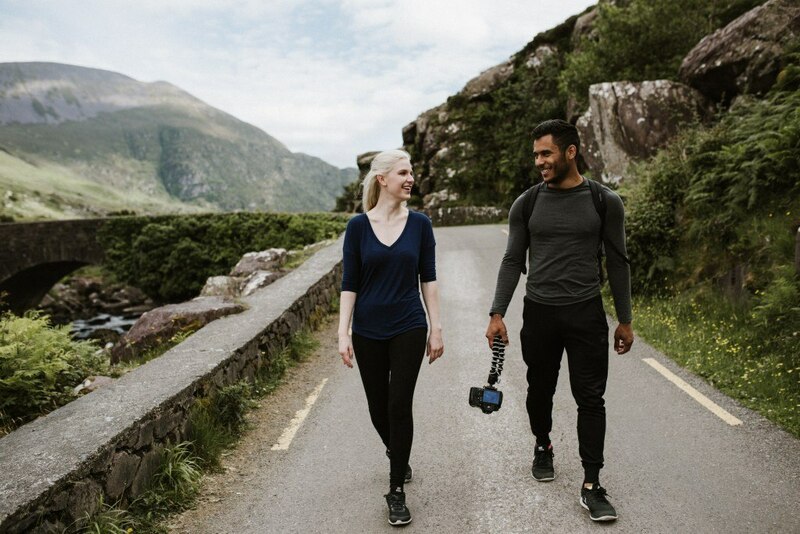 For those traveling as a couple, meeting other couple travelers is even better because of how many things you have in common right off the bat. It also gives you both space to hang out with someone new on your own. Don’t be afraid to attend events, walking tours, or online groups to meet new people on the road. Greg is a wise man, and my favorite belief that he holds, and that I share, is that any relationship can succeed if both parties commit to keep trying. This means from day one, both people are doing everything they can to be the best partner they can be. Both parties go out of their way to make the other smile, and both people never, ever stop trying, even when they’re mad, sad, upset, or hurt. Even through our toughest times, which we’ve certainly had, Greg and I always come back to this point and it’s a big part of what has kept us going the last 4+ years. At the end of the day, there’s no right or wrong way to travel. There’s no blogger, traveler, YouTuber, or luxury vacationer who does it “better” than anyone else. Never forget that initial pull to see and experience the world, and how buying that first plane ticket was the best feeling in a long time. Remember why you decided to travel, and keep going until it feels right to come home. Traveling as a couple is not easy. It tests relationships in ways I never thought possible and both parties need to be fully committed to making it work and embracing change. Traveling as a couple requires patience, forgiveness, and an understanding that travel changes everyone in different ways. For those who can talk through the issues, forgive the mistakes, and make the most of the reality of life on the road, traveling together can change your relationship in so many positive ways and you’ll become a stronger couple than when you left home.